To survive and remain engaging and relevant, shopping malls need to be more than just a mall — they need to innovate by introducing an exceptional dining and entertainment experience that complements and enhances the retail experience. 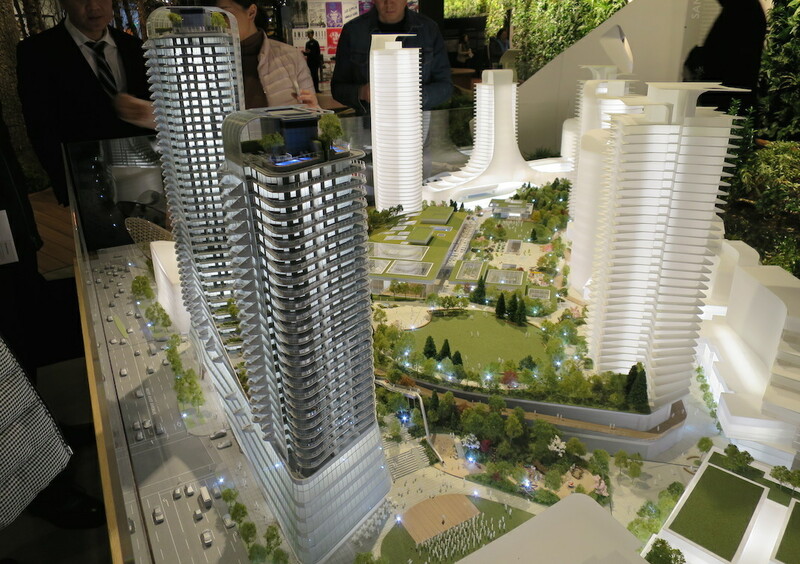 But given the calibre of the concepts and designs that are depicted and described, it would be a gross understatement to state that the developers and designers of the Oakridge Centre redevelopment only have a keen understanding of this 21st century retail concept. 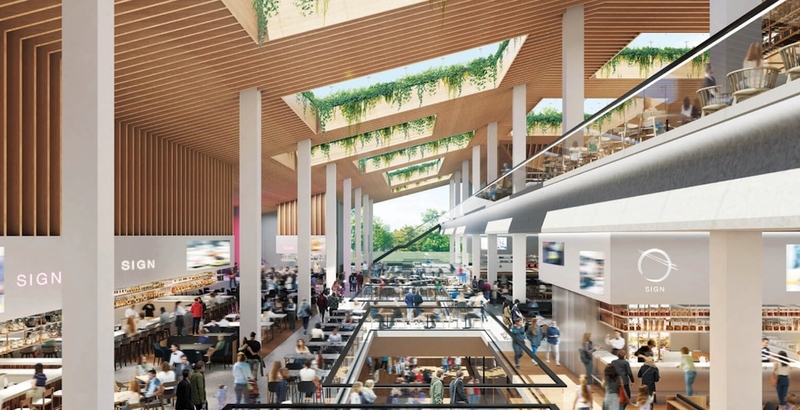 The hub of the reimagined shopping centre will be The Kitchen, a world-class food hall — not a traditional food court — with a floor area that spans nearly 100,000 sq. ft. over two levels. 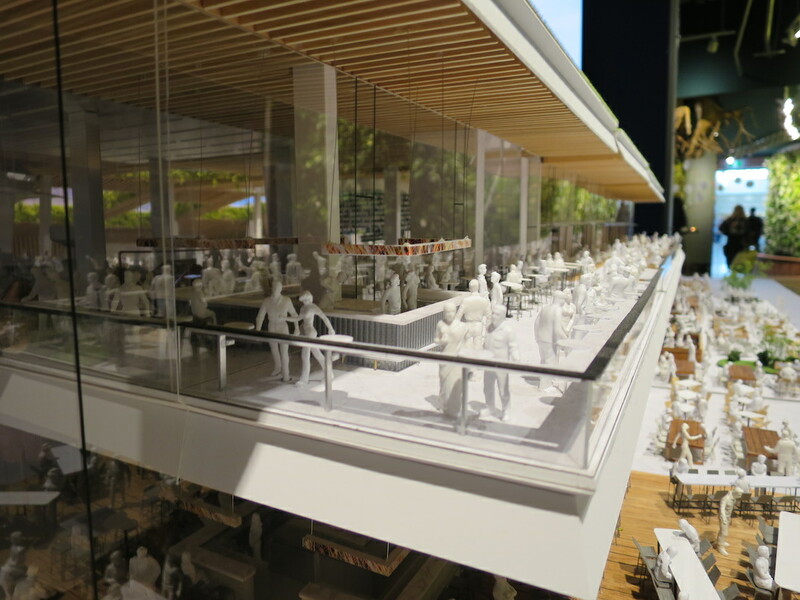 Its seating capacity is over 3,400 people, approximately three and a half times larger than BC’s largest food court at Metropolis at Metrotown. 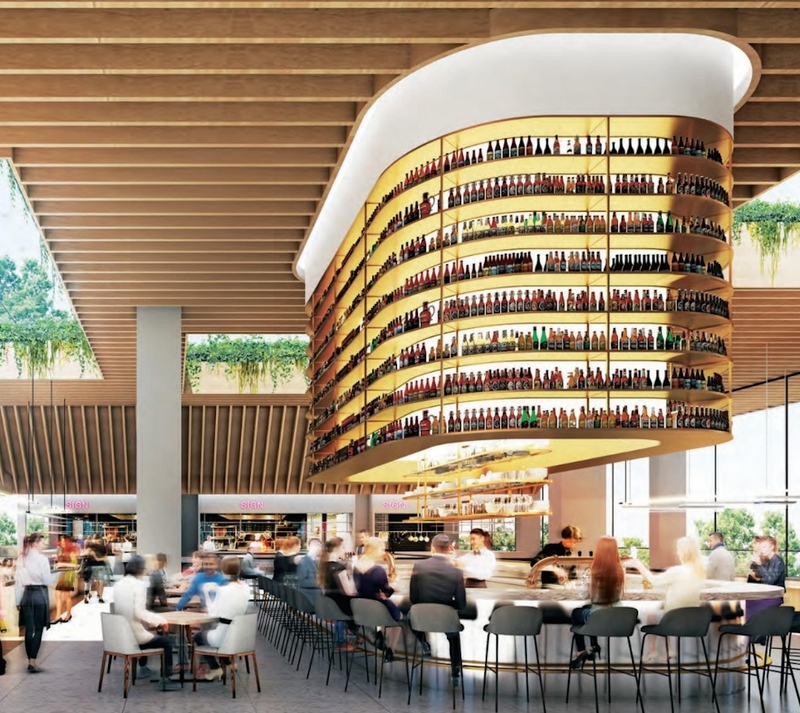 The main level, a 65,000-sq-ft space, features up to 20 kiosks operated by ever-changing culinary talent from around the world and indoor seating for 1,600 people. It will be one of the largest dining destinations in the entire region. Upstairs within the mezzanine is a 32,000-sq-ft brew pub that can accommodate at least 1,000 people, plus an additional 800 people on an outdoor patio that opens into the nine-acre rooftop public park with large garage-style doors. To provide a sense of just how ginormous this drinking hole will be, Craft Beer Market at the Olympic Village’s Salt Building, in comparison, has a floor area of 14,000 sq. ft. and a capacity of about 400 people. There will even be private dining areas and karaoke rooms for groups seeking more intimate spaces. 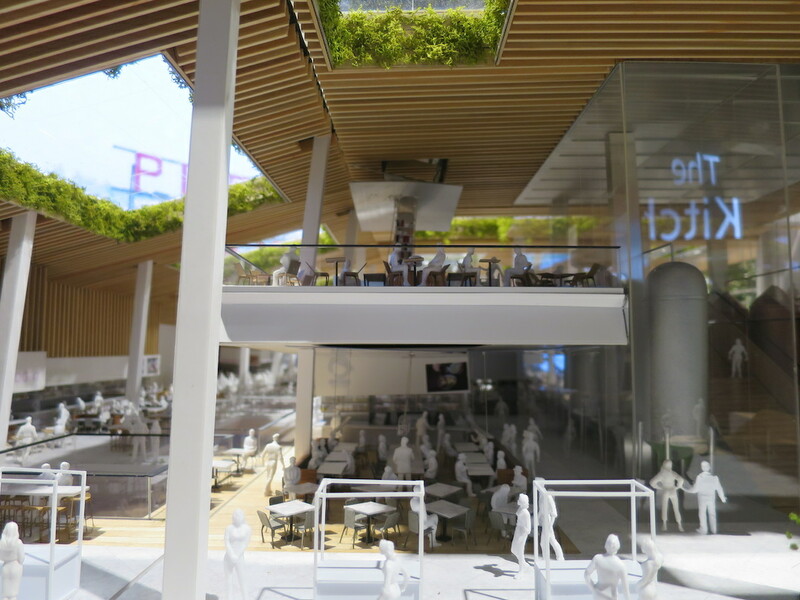 Jill Killeen, a spokesperson for Westbank, the local developer behind the project, told Daily Hive this surreal destination is inspired by the great traditional food halls of Europe — particularly the Crystal Palace Exhibition in London in 1851 — and the more contemporary ones in Asia. 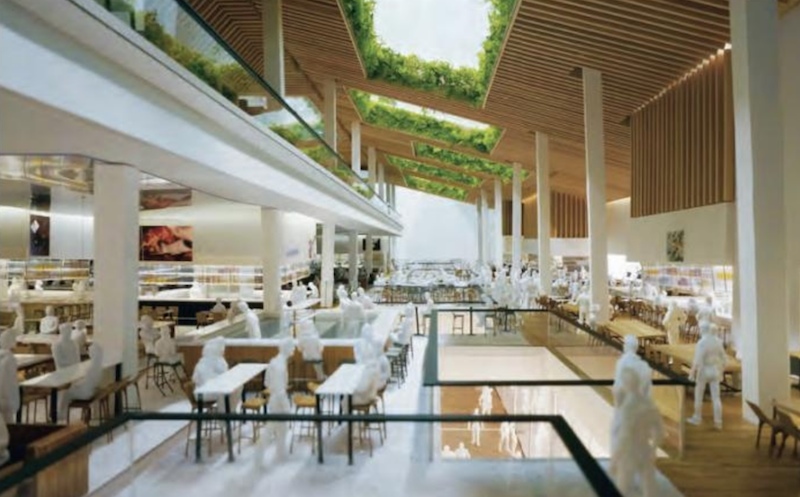 While the overall redevelopment concept was created by Henriquez Partners Architects, the interior design of each component of the project is by a different international firm. For Oakridge Centre’s retail and office space components, the interior design for these spaces are imagined by Tokyo-based Wonderwall. 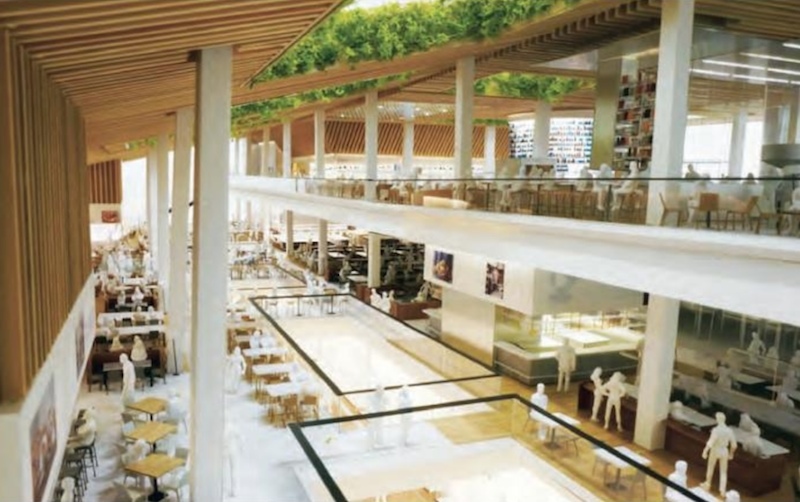 Giant skylights allow natural light to pour into food hall, pub, and double-height atrium that contains a portion of the mall’s indoor retail. Wooden beams covering the ceiling of The Kitchen create a warm gathering atmosphere that perhaps best resembles the interior of the West Building of the Vancouver Convention Centre. 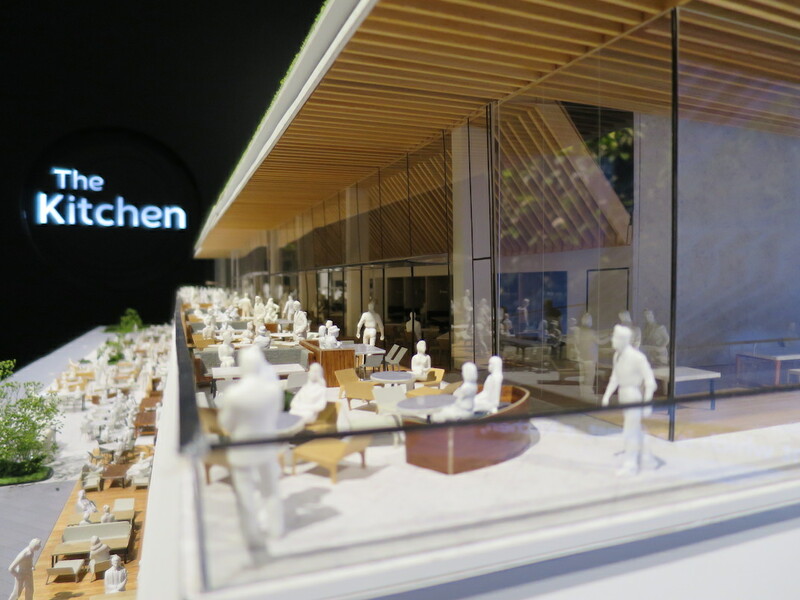 Don’t expect the usual assortment of fast food outlets at The Kitchen, as it completely abandons the food court concept. “Here, we will feature a quality, selection, and variety of food in capitals worldwide and only then by visiting every corner of the city and bring those together under one roof,” reads the project team’s description. 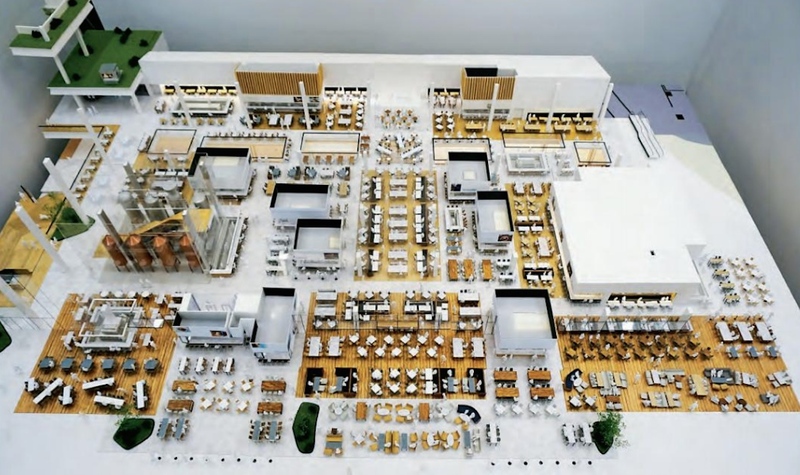 International chefs and their teams will operate in the kitchen spaces for about six months, although some will stay longer than this period, before new chefs and teams are brought in to start a new rotation cycle. Mall operators will provide the culinary vendors with all the equipment and tools they need to start cooking immediately. A formal music venue is located adjacent to The Kitchen, and there will also be several small venues within the food hall itself. 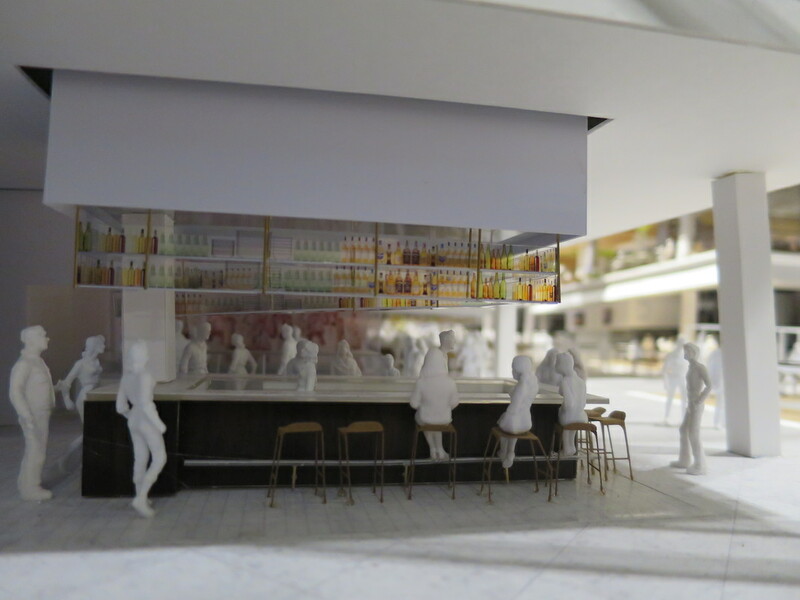 The mezzanine level above the food hall’s main level will be home to a massive pub with the city’s largest outdoor patio, which opens onto the park below. Escalators and stairs leading to the mezzanine from the main level are flanked by large beer vats to provide a ‘ceremonial entrance’ into the pub, featuring a wide selection of beers from around the world. 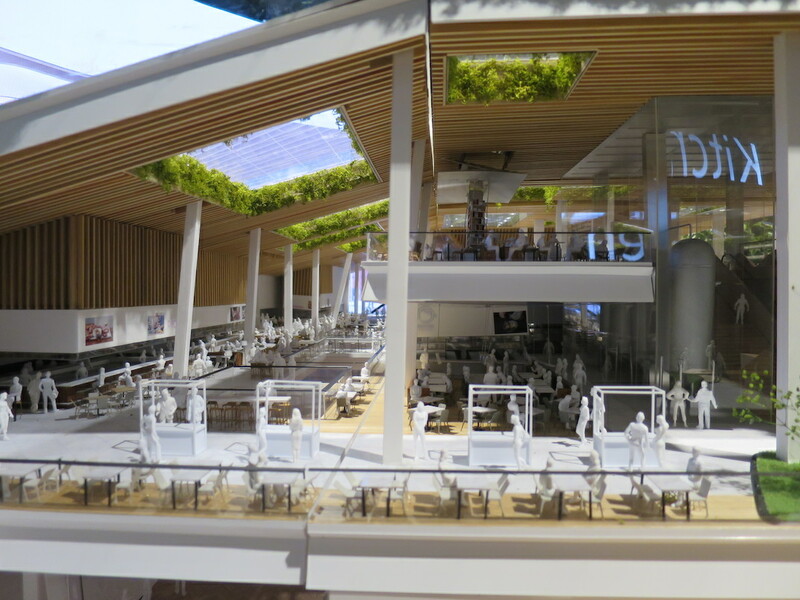 An assortment of kiosks are integrated into this space, just like the food hall, but they will be centrally themed. Water used by the brewery will be exclusively sourced from the aquifer under the shopping centre, and leftover grains from the beer-making process will be used in bread baked at Oakridge Centre’s pastry shop. “The whole operation will be geared to support a nose-to-tail approach in every kitchen,” reads the description. 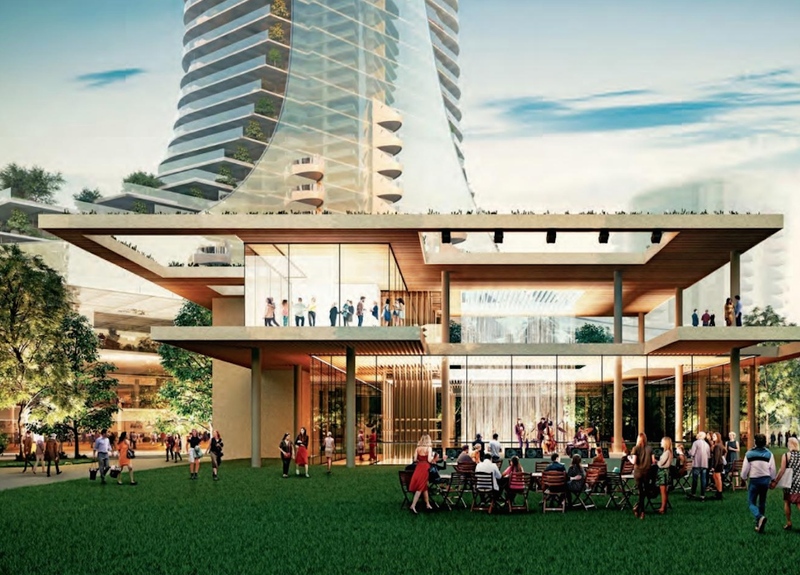 The new Oakridge Centre will be constructed in two phases, with the first phase at the site’s northeast corner breaking ground in 2019 and the final phase — entailing an area that includes The Kitchen — reaching completion in 2025. Over 4.5 million sq. ft. of new floor area will be created in the multi-billion dollar redevelopment. Much of this floor area will be dedicated to 2,548 homes, including 1,968 market housing units, 290 social housing units, and 290 rental housing units. The shopping centre’s retail space will be nearly doubled to about one million sq. ft., and approximately 290,000 sq. ft. of office space will be built within the lower podium levels of the towers — reaching a height of up to 42 storeys. As for public amenities, there is a 100,000-sq-ft community centre and a nine-acre rooftop public park over the new shopping mall. The design of this park was approved by the Vancouver Park Board earlier this year. Approximately 6,000 vehicle parking stalls are planned, which is less parking than a project of its density and size as it takes into consideration its location next to a Canada Line station and the new 41st Avenue B-Line. The project proponents are envisioning major improvements to the station’s entrance and capacity, including a dramatic glass canopy covering the spans from the median to the shopping mall entrance – covering the entire plaza and station entrance. The 28.4-acre mall is owned by Vancouver-based real estate investment firm QuadReal Property Group, which acquired the property from longtime mall owner and operator Ivanhoe Cambridge in early-2017. QuadReal also owns the old Canada Post building in downtown Vancouver. 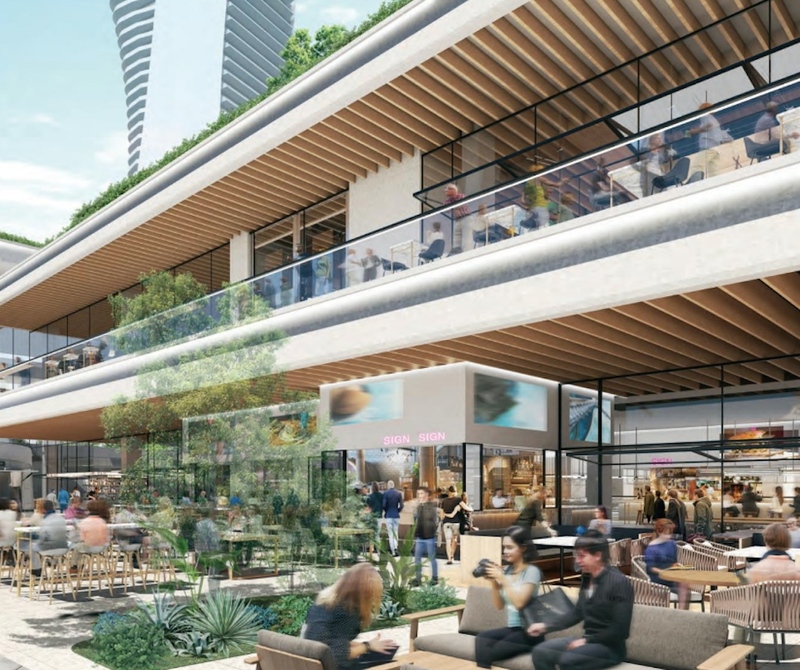 It is, of course, undergoing a redevelopment that will convert the property into a mixed-use commercial complex with the offices of Amazon, a significant retail component, and a 20,000-sq-ft food hall.